Listen now to hear how Hamilton Perkins is ingeniously turning trash into designer travel bags and jobs! We are big believers in the imagination and initiative of entrepreneurs. Hamilton Perkins, founder and president of Hamilton Perkins Collection, is one of them. Listen to our conversation about how he saw a mound of trash and an idea emerged. 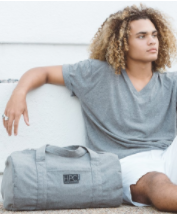 From this "a-ha" moment grew an innovative e-commerce retail business, turning recycled plastic bottles into designer travel bags at an affordable price, all the while adhering to the highest standards of social and environmental accountability. Hamilton's mission? To repurpose ALL plastic bottles going into landfills. Tune in to learn how he's doing it and creating jobs! 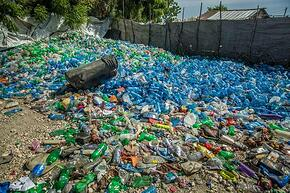 Did you know that humans have produced 9 billion tons of plastic? But only 9% of plastic waste is recycled. The rest ends up in landfills or the environment. But rather than wring his hands and hope for a solution, Hamilton Perkins decided to do something about it. To turn this waste into something of great beauty, he created Hamilton Perkins Collection, an affordable line of eco-friendly travel bags handcrafted by Haitian artisans from recycled bottles and billboards. In collaboration with the responsible-fabric supplier Thread, Hamilton Perkins Collection diverts plastic bottles, saves water and creates jobs in parts of the world that need them most. Each bag is completely unique and one-of-a-kind, just like you! Hamilton is a remarkable entrepreneur and as you listen to his journey, you'll want to grab one one (or more) of his bags! Here's a sample of one of his designs. Pretty fantastic, aren't they? Hamilton Perkins Collection has been featured in Forbes, Fast Company, The Washington Post and Money Magazine. It has put on 3 trunk shows at Bloomingdale's, and won the 2016 Virginia Velocity Tour business pitch competition, hosted by the Governor of the Commonwealth of Virginia. In addition, Hamilton Perkins (the man, not the collection) serves in a leadership capacity with several non-profit organizations and has been recognized for his volunteer work assisting low-income populations. He is also a contributing blogger for Huffington Post.